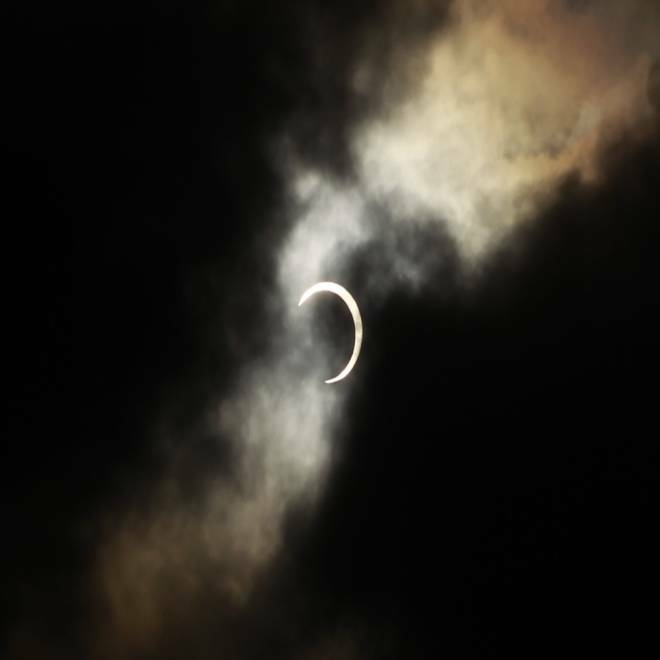 An annular solar eclipse is seen briefly during a break in clouds over Taipei, Taiwan. The sun, moon and Earth lined up today for a spectacular "Ring of Fire" annular eclipse that sparked social rites as ancient as Stonehenge and as modern as the Twitterverse. Eclipse fans gathered in locales ranging from Japan's Mount Fuji, to the alien-hunting Allen Telescope Array in California, to the ancient Petroglyph National Monument in New Mexico. But they gathered online as well, to share the wonders of the event via webcasts and chatrooms and Twitter feeds. "Is it bad that instead of just going outside I'm watching photo updates of the eclipse on Instagram?" one tweeter asked. Your photos of the eclipse ... it's not too late to share! Centuries ago, priests may have celebrated eclipses at Stonehenge with religious rites. But today, the residents of Redding, Calif., celebrated with barbecue parties. "It's become a very social event," said Tim Young, a physics professor from the University of North Dakota who helped organize an eclipse webcast from Shasta College in Redding. MSNBC's Thomas Roberts reports that the western U.S. and eastern Asia are seeing a rare type of solar eclipse. The event began in Asia, where the edge of the moon's shadow touched down at dawn on Monday (on the other side of the International Date Line). A camera crew atop Mount Fuji battled inclement weather that partially obscured the annular phase, but their live Internet stream still managed to catch a few glimpses through the clouds. More than 275,000 viewers tuned in to the webcast, the project's organizers said. Eclipse tours were arranged in Japan, China and Taiwan to take skywatchers to the central part of the moon's shadow, where the annular "Ring of Fire" effect was visible. Tokyo residents had a ringside seat, so to speak. "It was a very mysterious sight," Kaori Sasaki, who joined a crowd in downtown Tokyo, told The Associated Press. "I've never seen anything like it." The moon's shadow raced eastward at a speed of more than 2,000 miles per hour. 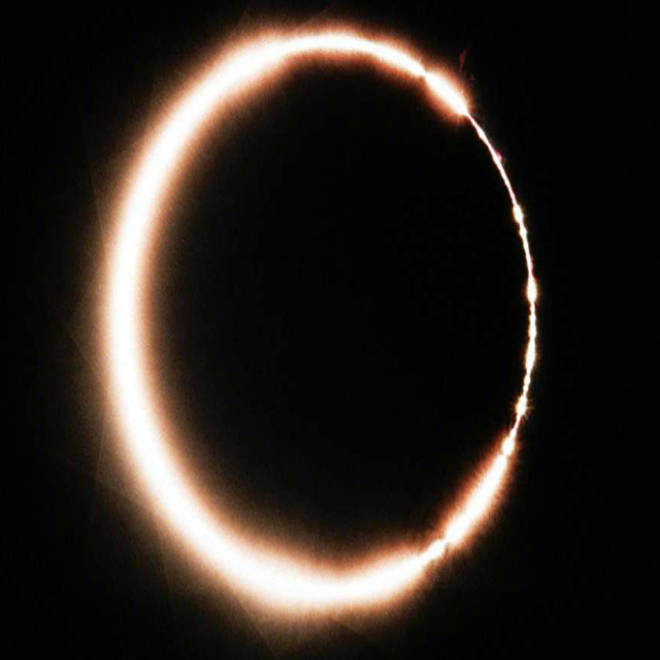 The annular phase could be seen only from locations along a roughly 200-mile-wide, 8,500-mile-long track, for just a few minutes in any one location. In contrast, the partial eclipse rose and receded over the course of a couple of hours, and was visible over a much wider swath of the world. The first hints of the partial eclipse didn't show up on the U.S. West Coast until around 5 p.m. PT (6 p.m. MT, 7 p.m. CT, 8 p.m. ET). The annular phase reached its peak for Americans after 9 p.m. ET, along a line stretching from the Oregon-California coast to around Lubbock, Texas. Astronomers and amateurs gathered to witness the annular eclipse at the Allen Telescope Array, 70 miles northeast of Redding. Guests walked among the facility's 20-foot-wide radio antennas, which monitor the skies for signals from extraterrestrial civilizations, listened to talks from SETI researchers, and then watched the eclipse through safety glasses or specially designed solar telescopes. One of the guests, William Phelps, peered intently through his 80mm H-alpha telescope, looking for the first signs of the moon poking into the sun's disk. He's a veteran of 16 previous eclipse-viewing sessions, but he still let out a yelp when he spotted the moon's edge through the telescope. "Yahoo! That's No. 17!" he cried. Then he let the other guests take their own peeks. As the moon covered more and more of the sun, the California afternoon seemed to get a bit cooler and dimmer, as if a tinted window had materialized in front of the mountain landscape. The sunbeams filtering through the trees threw crescent-shaped patterns on the ground. At the appointed time, the dark moon was completely ringed by sunlight, and the crescents on the ground turned into tiny O's. A cheer went up from the little crowd. "God, that's beautiful!" Phelps said. After a few minutes, the moon began its slow exit from the sun's disk. "I'm seeing beads," Phelps reported, referring to the "Baily's Beads" effect that occurs when bits of sunlight leak out through the valleys of the moon. Elsewhere, more than 5,000 people gathered at the University of Colorado's Folsom Field in Boulder for a mass eclipse-watching party. "We got several really long, good views, especially right close to sunset," university spokeswoman Erin Frazier told me. A full house attended an eclipse teach-in at Petroglyph National Monument in New Mexico, a sacred site for the Pueblo people and one of the prime viewing spots for the "Ring of Fire." Would-be watchers heeded the warnings about eye safety, and snapped up thousands upon thousands of eclipse-viewing glasses in the days leading up to the event. The University of Nevada at Reno reported that it sold 17,000 of the glasses at $2 each last week, and had to order 10,000 more. Young said he brought 600 of the special spectacles with him to Redding. His supply quickly dwindled. "It's become a mad grab for resources," he said. Young, who has been involved in more than a dozen webcasts since 2004, said interest in today's eclipse picked up surprisingly quickly. "Three days ago, it was not that big a deal, but as the news started playing it up, people got excited," he said. Decades ago, before the rise of sun-watching satellites, eclipses provided the best opportunities for astronomers to learn about the sun's structure — and they're still of scientific interest. This weekend, for example, Williams College astronomer Jay Pasachoff organized an expedition to the Jansky Very Large Array in New Mexico to monitor the sun's radio emissions during the eclipse. But experts say the phenomenon's main appeal nowadays has more to do with the human psyche than with scientific studies. "This can get people to look up from their little anthill lives, and maybe get a sense of the bigger cosmic cycles that are going on all the time over our heads," said Alan MacRobert, a senior editor at Sky & Telescope magazine. The eclipse experience can have a long-lasting effect, said Seth Shostak, an astronomer at the California-based SETI Institute who conducted a tutorial at the Allen Telescope Array. "Eclipses are like potato chips, notable for the fact that in all recorded history nobody has eaten only one," he joked. "Be warned." World's largest solar eclipse party? Game on! Ready for another "potato chip"? The next sky spectacular is a partial lunar eclipse, visible from Pacific locales on June 4. That'll be followed by a rare transit of Venus on June 5. The year's other big target will be a total solar eclipse, visible from Australia and the Pacific on Nov. 13. Stay tuned for coverage of all those astronomical events. Last updated 11:59 p.m. ET May 20.